I was amazed when John Bean, the veteran British nationalist, came out with an excellent novel a couple of years ago at the grand old age of 87. This even put Grandma Moses in the shade for late starts, and was a sign of hope to all those of us who continually defer our dreams. I was even more amazed that the novel, “Blood in the Square,” based on Bean’s own experiences in British nationalism in the 1960s, read so well. Rather than a novice, Bean was clearly an accomplished fiction writer and had little to learn. I remember entertaining the hope that there would be a few follow ups — and now, at an even grander age, there is! But rather than retread the familiar subject matter from the first novel — the multifaceted world of British nationalism — Bean has had a rush of ambition and attempted something not only radically new but also sweeping in its scope. 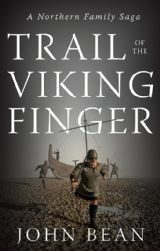 This is the historical novel, The Trail of the Viking Finger, which stands as a testament to the indigenous British people and stretches across ten centuries, from the immediate aftermath of the battles of Stamford Bridge and Hastings in 1066, and the dawning of the Norman epoch, to the early twentieth century, where the novel seems to end a little abruptly. I was inspired to write this historical novel as a result of preparing my own family tree, which I managed to trace back to a Brian Beane born at Saxton in Elmet — near York — around 1570. Nearly all locations, many Christian or forenames and occupations that are given in this novel are those of my family over the generations. As some readers may realize, this choice of format was heavily influenced by the multi-generational novels of Edward Rutherford, whose first novel Sarum (1987), I remember reading with interest many years ago. But while typical paperback editions of Sarum have upwards of 1300 pages, Bean’s saga is limited to a relatively short 228 pages. This means he takes a narrower focus. Rather than interweaving the destinies of several families, as Rutherford does, Bean focuses more sharply on his chosen line, the Byrnes, descended from a Danish Viking, Bjorn the Red, reluctantly stranded in England following the chaotic events of 1066. But even with just one lineage to concentrate on, 228 pages is still rather scanty, meaning that Bean is sometimes forced to rush things and leave chronological gaps for us to fill in with a few clues. The novel therefore breaks into the stories of several disparate individuals, loosely tied together by certain occasionally recurring genetic traits and characteristics — the Viking finger, red or reddish hair, and a “berserker” tendency towards violence (a legacy of his Indo-European ancestors) that by turns is both useful and harmful in different generations. Most of history, as Charlie Watts, the drummer of the Rolling Stones famously observed of rock ‘n’ roll, is mainly just hanging around. So it is that much of what Bean describes is the slow and steady work to gradually improve one’s situation — and that of one’s family — by hard labour, diligent businesses, marrying correctly, or improving farmland and other assets. This is then punctuated by more dramatic and dangerous episodes that reward some of the higher qualities in us. This chapter also contains a lot of interesting information about early medieval York, where the surviving Danes finally resign themselves to settling in Britain, instead of trying to return home. Ending up wounded, he is forced to make his way home, so we see no more of what turned out to be a brutal and epic struggle between Scotland and England. I got the impression here that Bean turned his literary back on the opportunities for dramatic events this war presented due to an underlying distaste for such intense conflicts among the indigenous peoples of Britain, possibly informed by the present-day realization that collectively we are under threat as never before. An earlier part of this chapter also briefly mentions another group that has intermittently played an important role in Britain’s story, namely the Jews. Another part of the novel that stood out for me was the tale of Richard Byrne, a cavalier cavalryman in the army of King Charles I in the struggle against the parliamentary forces. This, of course, was the period just before the Jews were let back into England, but there was already enough diversity and disagreement as revealed by religious and cultural differences between Englishmen, differences that often split families apart and which fuelled the complex political and military conflict of the Civil War. Such divisions have some of the flavour of our own day. Every British or White nationalist is keenly aware of how divergent their opinions can be from those of near relatives, and the problems this can create. In the case of Richard Byrne, his wife has become enamoured of Puritanism while he has been absent campaigning for King Charles. Finally she deserts him and emigrates to America. Reaching Newcastle, the young siblings enter a world where new industries, technologies, and opportunities open up for their talents. It is from this point onwards that real social mobility sets in, with subsequent generations using their carefully honed wits and survival instincts to take advantage of new business opportunities. Overall, some parts of the book feel a little rushed, but it is nevertheless a fascinating meditation on what it means to be British. The meta-point Bean makes throughout is that we are very much the direct result of our history, landscape, and interaction with each other, something that definitely cannot be said for the incomers brought into Britain by multiculturalism and globalism with no roots in Britain. But history never stops. The implicit question then, is will the Viking finger and the fighting spirit it betokens prevail. I for one believe it will.